Avant Jazz from Marshall Allen, Fred Frith, Terry Riley & Schoolkids. 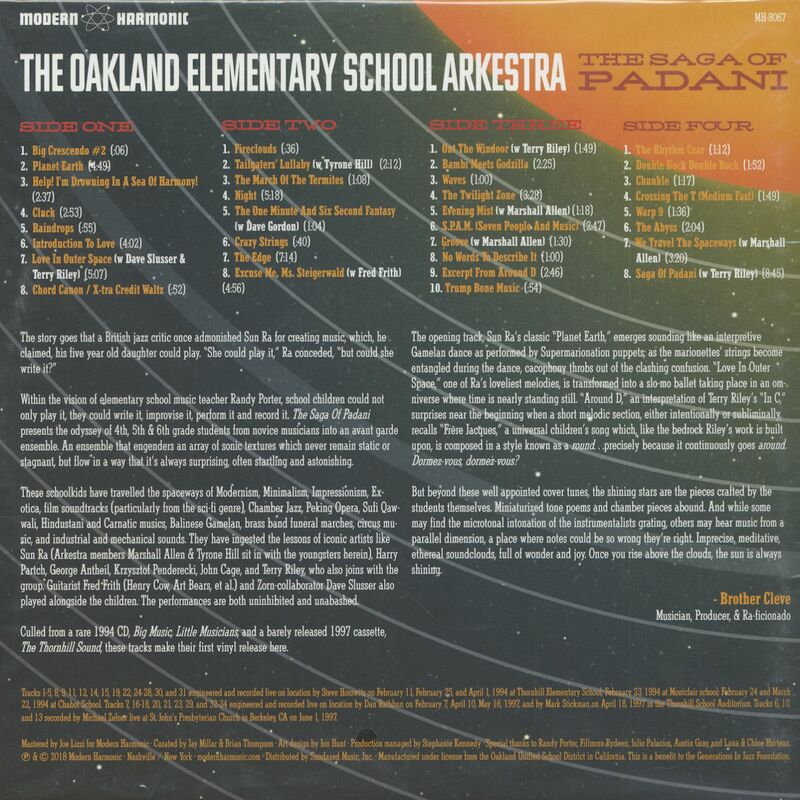 The Oakland Elementary School Arkestra presents the odyssey of 4th, 5th & 6th grade students from novice musicians into an avant garde ensemble. An ensemble that engenders an array of sonic textures which never remain static or stagnant, but flow in a way that it's always surprising, often startling and astonishing. These schoolkids have traveled the spaceways of Modernism, Minimalism, Impressionism, Exotica, film soundtracks and more. 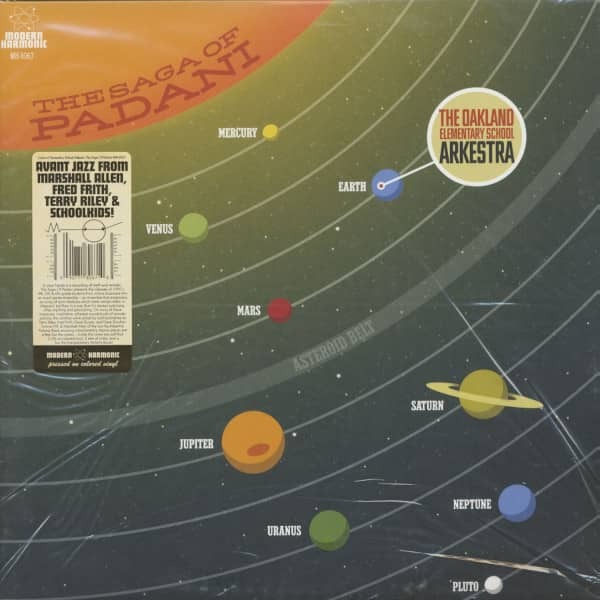 They have ingested the lessons of Iconic artists like Sun Ra (Arkestra members Marshall Allen & Tyrone Hill sit in with the youngsters herein), Harry Partch, George Anthiel, Krzysztof Penderecki, John Cage, and Terry Riley, who also joins with the group. Guitarist Fred Frith (Henry Cow/Art Bears et al) and Zorn-collaborator Dave Slusser also played alongside the children. The performances are both uninhibited and unabashed. Culled from a rare 1994 CD, 'Big Music, Little Musicians,' and a barely released 1997 cassette, 'The Thornhill Sound,' these tracks make their first vinyl release here. The opening track, Sun Ra’s classic “Planet Earth,” emerges sounding like an interpretive gamalan dance as performed by Supermarionation puppets; as the marionettes’ strings become entangled during the dance, cacaphony throbs out of the clashing confusion. 'Love In Outer Space,' one of Ra’s loveliest melodies, is transformed into a slo-mo ballet taking place in an omniverse where time is nearly standing still. 'Around D,' an interpretation of Terry Riley’s 'In C,' surprises near the beginning when a short melodic section, either intentionally or subliminally, recalls 'Frere Jacques,' a universal children's song which, like the bedrock Riley’s work is built upon, is composed in a style known as a round....precisely because it continuously goes around. Dormez-vous, dormez-vous? Customer evaluation for "Saga Of Padani (2-LP)"